REVO five-axis measurement system - CMM Inc. Designed to maximise CMM performance and maintain high system accuracy, this new measuring head and probe system from Renishaw offers countless benefits during part inspection. The REVO head works in a fast demanding motion, while the CMM moves in a linear slow fashion. The use of a flexible tip sensing probe system further adds to the system's accuracy and flexibility. Also, the removable probe system, used in combination with a low cost changer, provides added system flexibility. The Renscan5 technology is embedded in Renishaw's UCC2 CMM controller. This particular controller system forms the basis of the 5-axis measurement system. However, two of the axes are rotary and at the CMM quill. Please note: in order to achieve the high scanning speeds, it is essential that the 5-axis measurement system has a fully integrated control loop. T can be done by using Renishaw's UCC2 and SPA2-2 system. RSP2 is a dedicated lightweight tip-sensing probe for use on REVO systems, capable of 2D-scanning (x, y) and 3D-touch trigger measurement. The RSP2 has a universal body to which a number of different length stylus holders, with a maximum reach of 500mm, can be fitted. Surface finish measurement has traditionally required the use of the hand-held sensors or the part to be moved onto a dedicated measuring machine. The REVO SFP1 probe changes all this, making surface finish inspection an integral part of your CMM measurement procedure and the surface finish analysis part of a single measurement report. SFP1 is a dedicated lightweight tip-sensing probe for use on REVO systems, capable of surface finish measurement and has a universal body to which different surface finish styli can be fitted. For optimum metrology, REVO probes and stylus holders should be changed automatically using REVO change ports (RCPTC and RCP) and a flexible change rack (FCR25). These ports are mounted on the modular rack system (MRS). Calibration on traditional CMM systems consumes a considerable amount of time that could otherwise be used for part measurement. 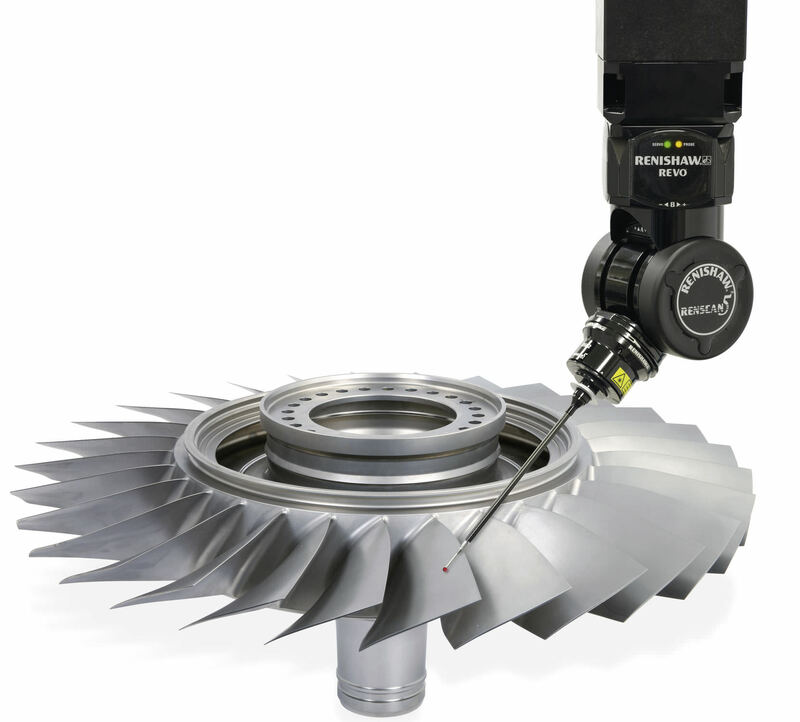 The unique calibration technique developed for REVO determines the actual head and probe geometry, allowing measurement in any position from a single operation, thus dramatically reducing calibration time. The measurement of valve seat and guides has traditionally been very challenging, involving time-consuming methods that often do not provide a sufficiently capable measurement. REVO and Renishaw's Renscan5™ technology change this situation dramatically. It is now possible to collect very quickly large amounts of data, from which the analysis parameters for both the valve seat and the valve guide features can be calculated. The method performs exceptionally well in repeatability and reproducibility tests.